The Ozobot, a new intelligent game piece for the iPad, is really, really good at following directions: He never wanders off, turns around when you tell him to, and can change pace quickly. Perhaps that's why they were such a hit at CES, where they made their public debut. Designed to spice up traditional game night, Ozobot uses the iPad as an in-person social experience, instead of just playing games with friends virtually. These little robots glide across the top of your iPad's display, never straying from the track drawn on screen. It can follow lines and commands on both physical and digital surfaces, responding to different colors. For example, if you want Ozobot to move a little quicker, draw two blue dots close together on the track. When Ozobot glides over those dots, it will speed up. Though specifically made for the iPad, it will follow a hand-drawn track as long as it's at least 6mm wide--about the width of a large Sharpie line. The Ozobot has four companion apps that are actually separate games: A strategy puzzler, a game of chance, a maze, and a blank canvas to create your own racetracks. 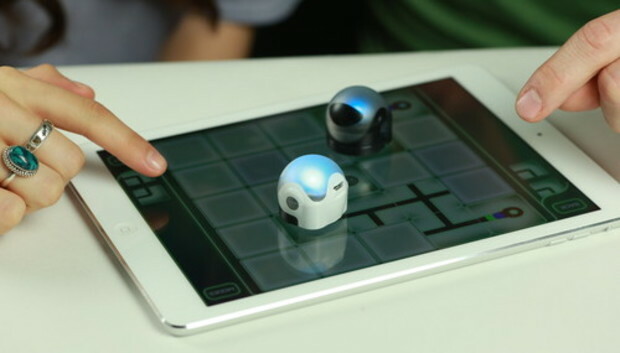 All of the games are either single or multi-player, and if you're playing with friends you can either share one Ozobot or use multiples. It can stand about an hour of continuous play and takes about 25 minutes to recharge. With Ozobot's variety of games and options for creating your own tracks, it's sure to be fun for both kids and adults alike. The Ozobot will be launching as a Kickstarter project later in January, and should be available to everyone for $60 by June.